Hi there! Back in the summer, my 12 YO daughter was invited to her best friend's birthday party. My girl asked me to make a special card. I LOVE custom challenges like this! You can see some of my other custom creations here and here. The birthday girl adores cats. This fact gave me the purrfect (ha) chance to use my new Cat's Meow stamps and dies from Papertrey Ink. I'm kind of new to the "coordinating dies" thing that everyone's doing these days. Have to say I really appreciate having these dies. Hand-trimming these stamped objects would not have been fun. The sentiment comes with the Cat's Meow set, but I wanted my scene to have a picture hung on the wall above the cat. Enter this pretty frame from Vintage Frames / Inspired By Stamping. It was just the right size for the words. I stamped it in chocolate ink, then drew on a nail and picture wire with a fine-tipped Copic marker. She's pretty tough to photograph with all that dark fur. I keep trying! I have a cousin to your cat named Houdini!! 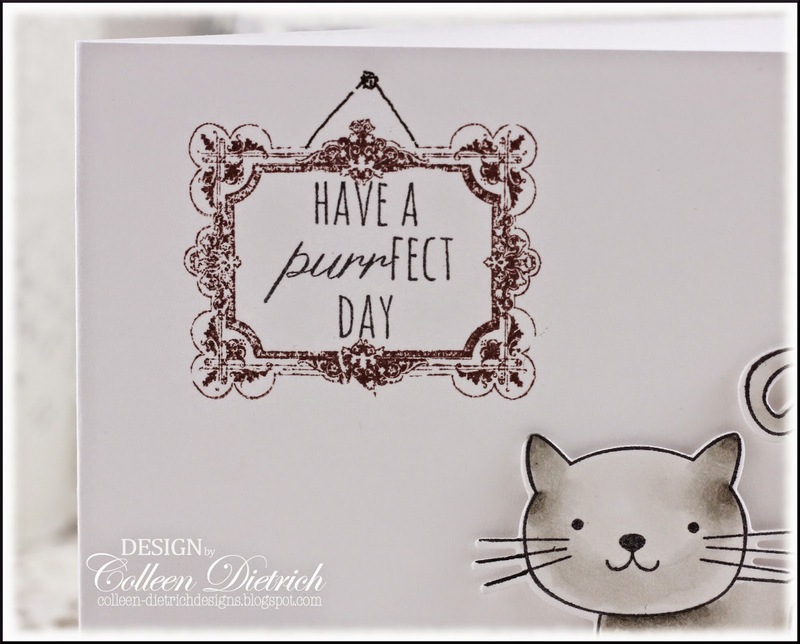 LOVE this cat card! Truly Purrfect for a cat lover! Oh wow, Love your PTI card!!! So gorgeous! LOVING that kitty and the frame!! And your kitty is beautiful too!!!!!! 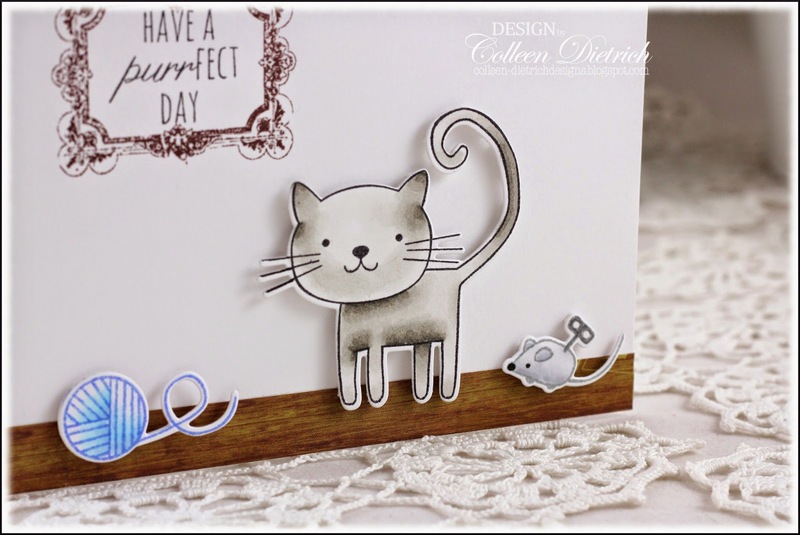 You do custom cards well Colleen!! Your daughter's friend is gong to love this! 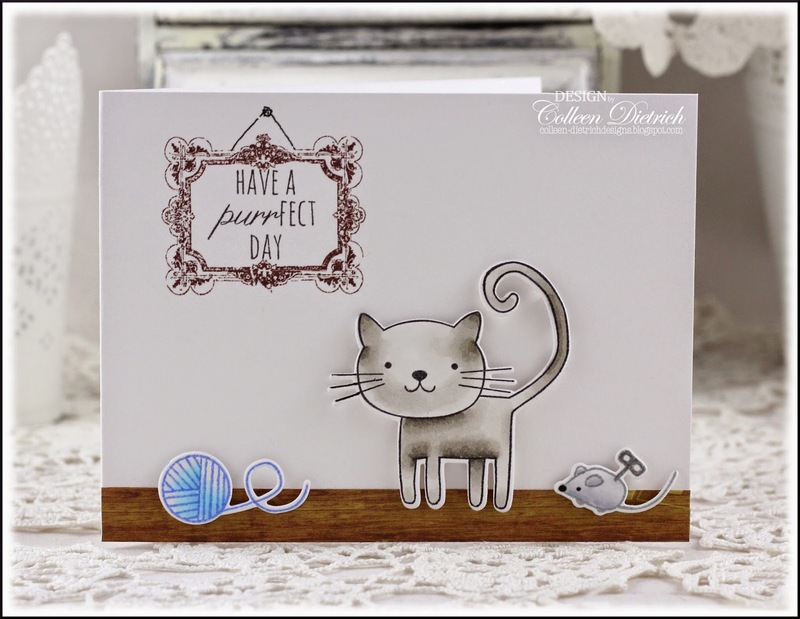 A darling kitty critter card! Of course, I love it. Your coloring is great, too. Those matching dies can certainly come in handy and are pretty fun. I have plenty of dies, but only a few of the stamp/die coordinating sets. The stamped picture frame is gorgeous. A nice finishing touch! That card is adorable. Love your black kitt too :) Give her a snuggle for me. This card makes me so happy Colleen. I love the frame on the wall. Adorable.